Hidden Figures is an inspirational documentary about how 3 African-American women tenaciously broke down racial and gender barriers while working as mathematicians in NASA’s Langley based West computing group in the 1960’s. Famous historical figures like Martin Luther King and President Abraham Lincoln have had plenty of media and Hollywood coverage for their roles in fighting against discrimination, however it is important to also tell the stories of people in less powerful roles who also managed to break through “Jim Crow” segregation barriers and made life fairer for future generations. Although slavery ended in the United States of America with the ratification of the 13th Amendment to the US Constitution in 1865, progress towards truly equal and not separate treatment of all Americans has been slow in the over 150 years that have passed since. Hidden Figures is set against this background of racial discrimination, as well as barriers towards women in the workplace such as being excluded from important meetings or being barred from applying for senior roles like engineers that they were just as qualified as men to do. The three main protagonists of this film give us a glimpse into the lives of Katherine Johnson (Taraji P. Henson), Dorothy Vaughn (Octavia Spencer) and Mary Jackson (Janelle Monae) who worked as NASA human computers and were critical to the success of astronaut John Glenn’s Friendship 7 mission in 1962. As a side note you will notice during the movie that our 3 main characters are referred to as computers. Before electronic computers became prominent, computers were not machines but really smart people who excelled at maths, logic and science. Computer rooms were full of people sitting at desks with calculators, piles of paper, pens and pencils, not humming stacks of machines cabled together. Hidden Figures opens in Australia on February 5, 2017. I watched a preview screening at Hoyts Entertainment Quarter, Moore Park, Sydney. A few days prior, Hidden Figures had been awarded Outstanding Performance by a Cast a Motion Picture at the Screen Actors Guild Awards (equivalent of a best film Academy Award). Although the Declaration of Independence stated that “All men are created equal,” due to the institution of slavery, this statement was not to be grounded in law in the United States until after the Civil War (and, arguably, not completely fulfilled for many years thereafter). In 1865, the Thirteenth Amendment was ratified and finally put an end to slavery. Moreover, the Fourteenth Amendment (1868) strengthened the legal rights of newly freed slaves by stating, among other things, that no state shall deprive anyone of either “due process of law” or of the “equal protection of the law.” Finally, the Fifteenth Amendment (1870) further strengthened the legal rights of newly freed slaves by prohibiting states from denying anyone the right to vote due to race. 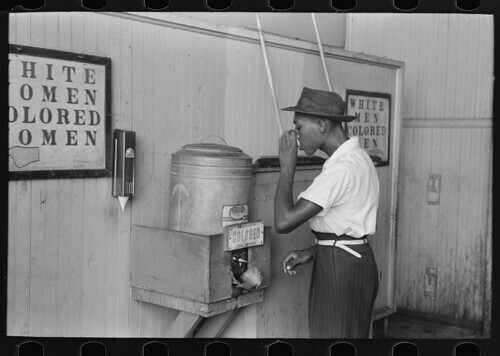 Despite these Amendments, African Americans were often treated differently than whites in many parts of the country, especially in the South. In fact, many state legislatures enacted laws that led to the legally mandated segregation of the races. In other words, the laws of many states decreed that blacks and whites could not use the same public facilities, ride the same buses, attend the same schools, etc. These laws came to be known as Jim Crow laws.